Join us for a demonstration with Holbein artist and educator Jamie-Lou Nicol and explore Holbein Artist Watercolour and Mediums as well as their innovative Acryla Gouache. Holbein’s world-renowned watercolours are available in an extensive palette of 108 highly concentrated colours. 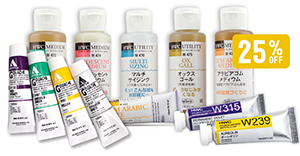 Discover what makes them the preferred choice of watercolourists worldwide and what distinguishes these watercolours from other brands. Holbein’s 6 watercolour mediums can be used with watercolours to create interesting effects and enhance the properties of this luscious medium. All participants will receive Holbein samples and literature to take home. One lucky attendee at each Opus location will take home a door prize with a retail value of $60! Artists of all levels of experience welcome. Registration is required, so sign up today! To register, please contact the store you would like to attend the demo at. Click on your locations demo link below to find the number, or select the location from our locations page.